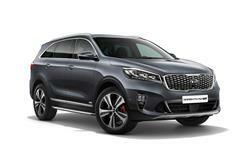 Find out everything you need to know on the new Kia Sorento from independent vehicle review website Car And Driving. You can watch the video review to the left to see more of the car or read their written review below to get a true insight from an expert in the automotive industry. Prices start in the region of around £30,000 which is still excellent value for money. To put that figure into perspective, the similarly-sized Volvo XC90 will require you to dig in for another £20,000. In fact, Kia's asking for the sort of money you'd normally budget for something much smaller, such as a Toyota RAV4 or a Honda CR-V. At those prices, we'd forgive the Sorento for being a bit rough round the edges. The fact that it looks very well-appointed only makes its rivals' task even tougher. All four well appointed trim grades have seven seats, with a 40:20:40 split in the middle row and a 50:50 split in the rear. The new eight-speed automatic gearbox is optional in place of the six-speed manual at the KX-2 and KX-3 levels and standard with the plush KX-4 model. From KX-2 upwards, buyers have the choice of ordering the car without the self-levelling suspension feature at a saving of £500. This improved Sorento debuts a number of technologies to improve convenience and further enhance the ownership experience. For a start, there's Kia's latest 8.0-inch touchscreen infotainment system, with navigation and Kia Connected Services powered by TomTom. The new set-up offers Apple CarPlay and Android Auto, enabling full smartphone integration. Buyers can upgrade their Sorento with a new 640-watt, 10-speaker surround-sound Harman/Kardon sound system. Safety improvements include the addition of a 'Driver Attention Warning' system that combats distracted or drowsy driving, plus there's a 'Lane Keeping Assist System', 'High Beam Assist' and full LED headlamps with Dynamic Bending Light technology.